Two of my favourite things. Two of my favourite things : Lush and freebies. 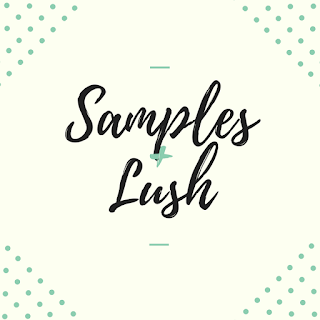 I am back again with a Lush product- 3 actually; sample sized. 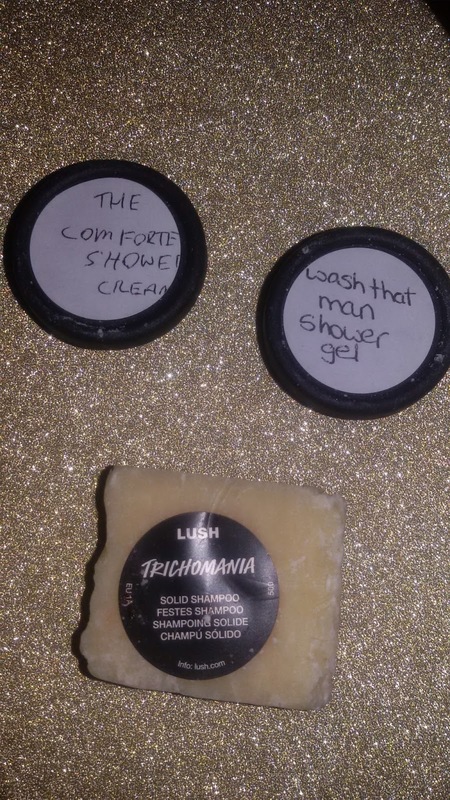 These are the Trichomania Shampoo Bar, Wash that man right out of my hair Shower jel, and The Comforter Shower Cream. The concepts of shampoo bars was quite alien to me as I am used to only using liquid shampoos which is why I requested a sample. Now, I will be talking to you about my experience using this shampoo bar from the perspective of someone who has greasy hair. Before I get to talk about my experience with it though, let me tell you a few things about it. According to the Lush website, this bar is full of creamed coconut which is what creates it lovely, sweet scent. Creamed coconut is full of natural protein which will help strengthen the hair. I straighten my hair often, and since I've been using Trichomania my hair feels soft instead of having that dry, crunchy feel to it. What I loved about this shampoo is that it lathers up really easily and produces a very thick, creamy foam that makes your hair feel instantly moisturised. The lather almost felt like a padding, which after I washed it off, helped to thicken my hair and give it some much needed volume. While it doesn't make it as frizzy as Big, it didn't feel as thin as I'm normally used to, which was a blessing. 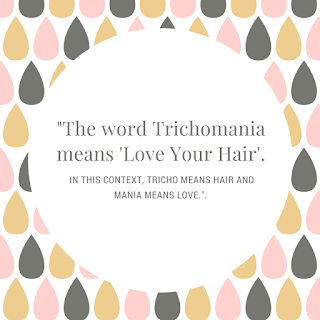 Trichomania lathers up wonderfully as it creates a lot of bubbles as you apply it to your hair, and when dry it leaves your hair feeling soft. It has a thick silky feel to it as it lathers up. Tips for storing Shampoo Bars. According to Jane ,from Lush UK Customer care, " To keep your shampoo bars in good condition, you could put them on soap dishes. As long as you air dry them first, you can store them on wooden slatted soap dishes, china or plastic ones, or on wire racks, if you have those in your bathroom." Or you can buy metal tins from Lush that come in 3 shapes : square, oval, and round. Wash that Man Right Out Of My Hair Shower Gel I want to talk about one of the greatest mysteries in my life at the moment, okay? Apart from the great mystery that I associate with this red shower gel, I guess I should point out how much I love it's thick formula and the way that it makes you feel refreshed when using it. With this product, a little can go a long way as it lathers up rather quickly. I had heard so many great things about The Comforter . However, I didn't want to actually buy it a bottle of it without actually knowing whether I like it or not. 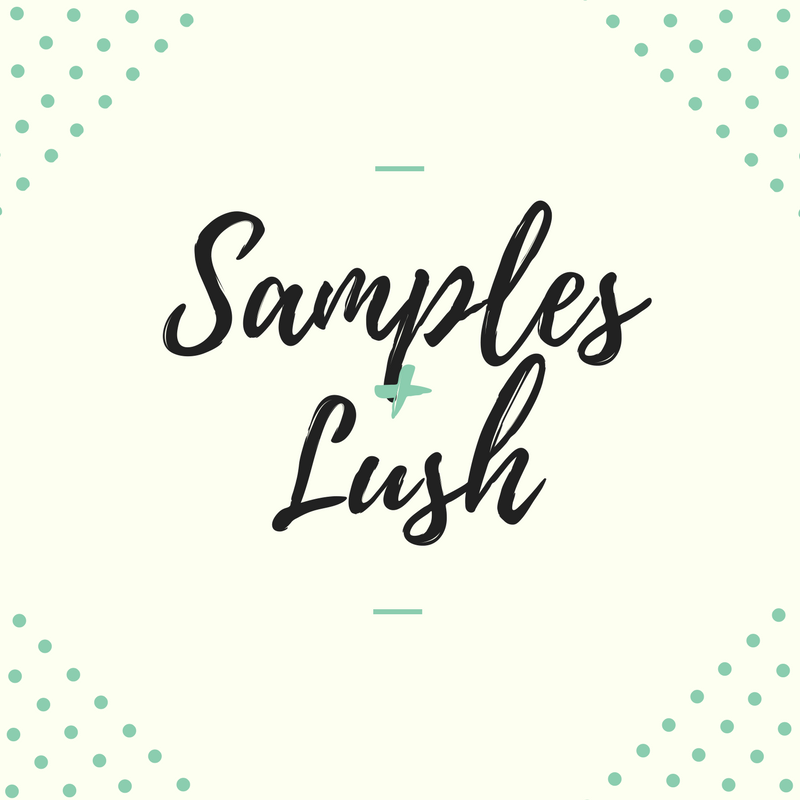 So, I requested a sample and I LOVED IT. First of all it's a pink liquid so it looks really pretty but it's also really creamy. One whiff of it and you can tell that it's a really sweet scented shower cream and oh, so very fruity. The fruity scent is contributed by the Cassis absolute, which is basically Blackcurrant absolute. The Cassis absolute is also found in The Comforter body lotion and The Comforter Bubble Bar. The Cassis Absolute, Almond oil and Bergamot oil together ,amongst other ingredients, produce this wonder Shower Cream which helps moisturize the skin and leave it smelling incredible. The fragrance actually lasts a few hours on the skin which makes me love this product so much more. The only down-ish side to this product is that it doesn't seem to lather up a lot as you rub it in the skin. It's not actually a down side for most but for me , a passionate lover of bubbles, it is a downside. Other than that, it is wonderful. My brother has purchased the big bottle so now I have more than just the sample size. I really do want to thank Jane from Lush for answering my questions ! She basically provided most of the information for Tips for storing Shampoo Bars. I am slowly exploring other Lush products instead on being stuck on Bath Bombs, Shower Gels, and Bubble Bars. Let me know your favourite products from Lush ! Follow me on Twitter : @Hashtagaby Follow me on Instagram : aby1997. Add me on Snapchat : aby1997. Before we begin I want to take you back to 2012. January 6th 2012 was the day I discovered One Direction. The reason I am telling you this is because the boys of One Direction have a small number of tattoos. One of them happens to be on Louis Tomlinson's skin, which I had sworn to get inked into my skin. But as I grew older (and a tad wiser) I realized that I shouldn't get it as it looks rather childish. Now, as I was curiously browsing through Inkbox's selection of temporary tattoos I spotted a tattoo similar to that of Louis's so ,obviously, I got it. I, also, got a Raven tattoo from their The Mummy Collection for my friend. 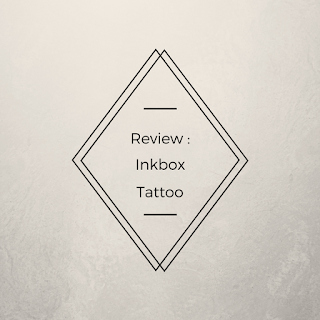 SO....here is my review of the Inkbox Temporary Tattoo "Papel". In other words, a paper airplane. This was by far my favourite trip to the United Kingdom. Hello my lovelies. I am so happy that you have taken the time to look at my blog and that you are actually reading this right now. 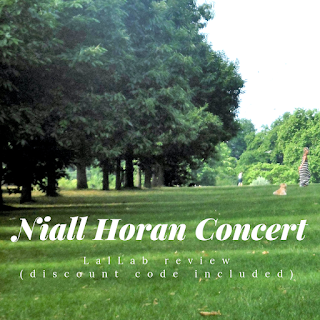 Today is going to be a mixed blog, as in I am going to narrate my experience of going to a Niall Horan concert. I am also going to review a product by Lalalab. If you have seen one of my earlier posts on this blog (A-Z of me), you would know that I am a huge One Direction fan. What I may have never spoken of is that Niall Horan is my favourite member of that band. In the earlier days of One Direction he was very insecure, and as an insecure girl myself I related to him and declared his cute face my favourite. As any other One Direction fan I was heartbroken with the news that they will be going on an 18 month hiatus. 3 years later they are still on hiatus; however, I am grateful for it. If it wasn't for the band to be on break, I would have never gotten the chance to meet my favourite. This week I'd thought that I'd post another easy recipe. 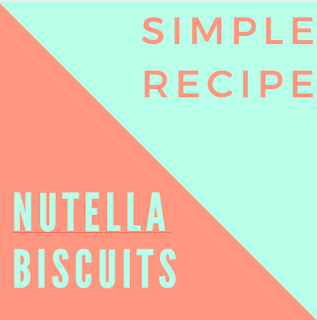 Usually the recipes I post have 3 Main Ingredients but this one has 4 so I couldn't name the blog post "3 main ingredient recipe :Nutella biscuits " Never mind though, it is still an easy and simple recipe that should take around 30 minutes to prepare and bake.